What’s going on with this new Shadows Over Innistrad Planeswalker? Nahiri’s [+2] is great because it helps her reach her [-8] so quickly. Note: You don’t even have to discard a card! You can “just” give Nahiri two additional loyalty if you want to. 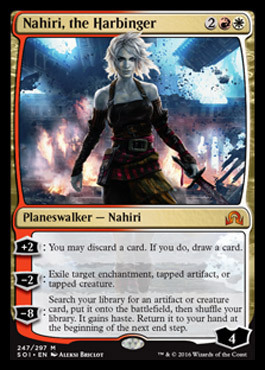 That said, Nahiri is actively great with cards like Fiery Temper. Nahiri is “actively great” with Madness! Patrick notes that if you want to play a gigantic (if hard-to-cast) monster for Nahiri’s [-8] ability you might accidentally draw it. Luckily Nahiri’s [+2] ability lets you discard the aforementioned uncastable monster, cashing it in for an action card. Nahiri’s middle ability is actually her bread and butter. 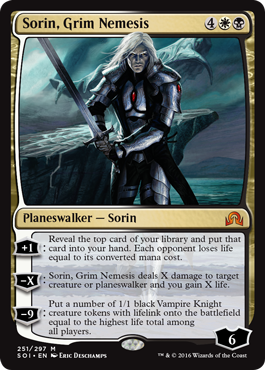 The obvious thing here is that Nahiri can act basically as two Utter Ends for the cost of one. Nahiri gives players the ability to deal with enchantments and artifacts without having to dedicate specific slots. 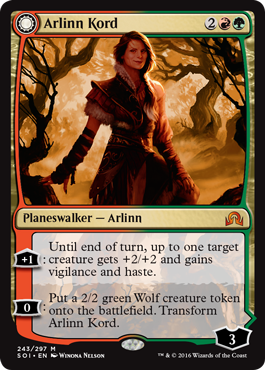 Of course, you can just play Nahiri, use her [-2] the first time, and be left with a powerful Planeswalker! Nahiri’s “ultimate” is not the kind of ability that automatically wins the game. However there is a lot of play here. Nahiri can level up very quickly due to her [+2] ability. This can let you cash in your four mana planeswalker for a much more powerful finisher… While saving mana. Nahiri’s most obvious playmate at this point might be Dragonlord Atarka. She drops Atarka the first time (letting you get that trigger), lets you slam in for 8 (i.e. “infinity” on its side) and then even bounces Atarka back to your hand so you can re-play it for additional 187 action! Powerful, certainly… But obviously super powerful, or not obviously super powerful? Epiphany at the Drownyard is our exclusive Shadows Over Innistrad preview card! Epiphany at the Drownyard is a powerful and flexible new way to draw cards come Shadows Over Innistrad. It has great flexibility because you can burn it for two (or even just one) mana… Or tap tons of lands into it for a tremendous long game impact. … But how much mana should you pour into your Epiphany at the Drownyard? x=0 : You’re not going to be doing this very often, but when x=0 Epiphany at the Drownyard costs exactly U. 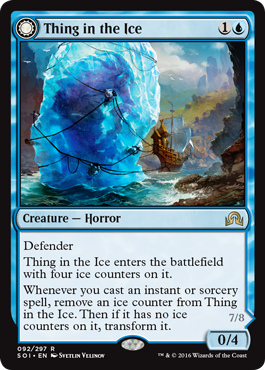 This off-label tactic might be exactly how you use your last mana to flip over your Thing in the Ice on the cheap. 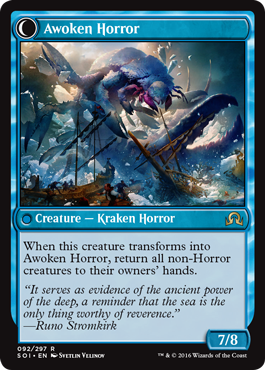 This is not “card disadvantage” when Awoken Horror sends a ton of token creatures home, and the tactical advantage might be worth more than a card anyway, depending on board position. x=1 : You’re basically cycling the card for two mana. 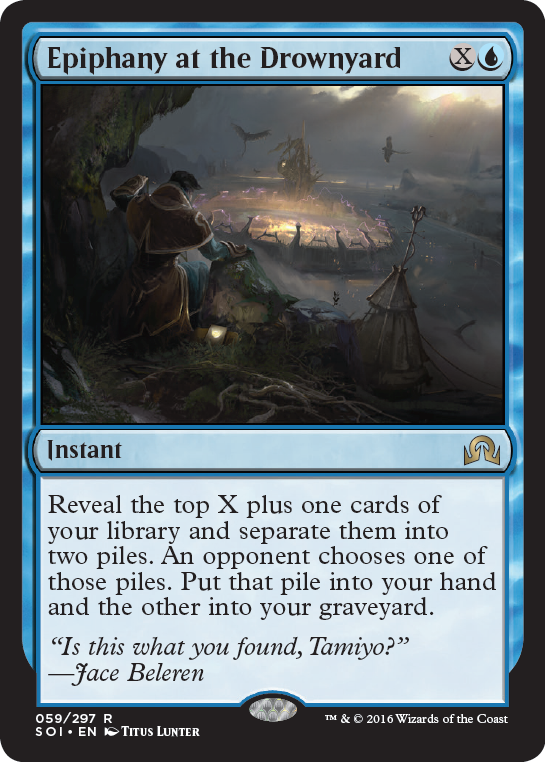 When x=1 you can put one card into each of the two piles; so you’re basically trading Epiphany at the Drownyard for one of the next two cards in your deck (it replaces itself) but you are also putting two cards into the graveyard, which can be helpful with Jace, delve cards, etc. x=2 : When x=2 you are flipping over three total cards. All other things being held equal you will put one card in one pile and two cards in the other. Most of the time you will be getting the same number of cards as when x=1, but you will have more control. For example, say there is a card you really want… If you put it against two cards the opponent will have to evaluate whether one good card is worth two other cards. x=3 : When x=3 Epiphany at the Drownyard costs the same as Inpsiration, Fact or Fiction, and of course Steam Augury. It is very comparable to Steam Augury at this point… You will end up with two cards for four mana in most cases; the difference here is that you will be putting only two additional cards into the graveyard instead of three. x=4 : This iteration of Epiphany at the Drownyard will be a relatively weak step up from when x=3. You will probably only get two cards (still); and Epiphany at the Drownyard will be exactly a Steam Augury but for one more mana. 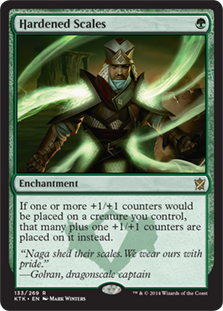 x=5 : As Patrick said, at six mana you will get the same number of cards as when the mighty Sphinx’s Revelation cost six. That’s kind of a big deal! At any point after this Epiphany at the Drownyard will look increasingly potent. Remember: You can always do weird things like putting all the cards in one pile. The opponent will have to choose between giving you a ton of cards in hand… Or a ton of cards in graveyard (which might be what you want). Lots and lots more from Michael and Patrick on this new card (and other topics) in “Epiphany at the Drownyard”! Want to hear more from Top Level Podcast? 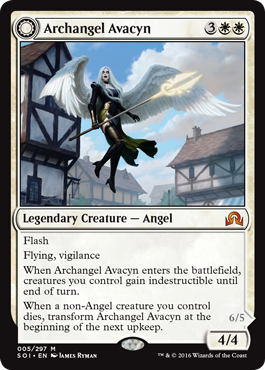 In its natural form, Archangel Avacyn is like a Serra Angel with upside. In addition to its natural state as a 4/4 vigilant flyer for five mana, this hot new card has flash. That means that if you are a Draw-Go style Control player, you will not be required to risk mana on your own turn to play your endgame threat. You can sit back with permission mana open and wait and see. She and all your other creatures become indestructible, too! 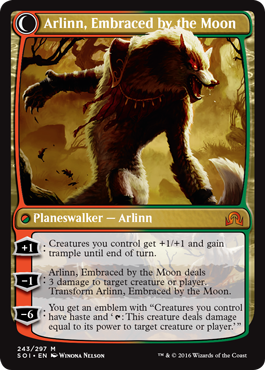 Now you can talk about fighting 4/4 creatures successfully, too. How about the Christine Sprankle flip-side? Remember what we said just a paragraph or so ago about 2/3 and 3/3 creatures? Sorry Reflector Mage! 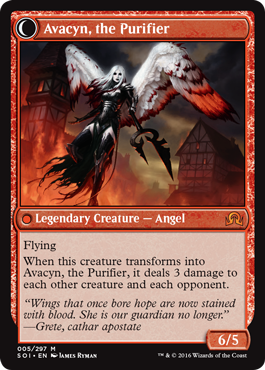 Avacyn, the Purifier is going to be an amazing, possibly format-warping, new card! At the very least, think about ticking up your Gideon to five loyalty against five open mana. Otherwise, Avacyn might just purify him. … As if a Tarmogoyf can reasonably expect to be 7/8 like Awoken Horror.